At Messiah Lutheran Preschool in keeping with our goal to educate the whole child, in mind, body, and spirit, it is our policy to plan outdoor learning activities as often as possible. We are fortunate to have access to a wonderful outdoor classroom. Whenever the weather permits we like to enjoy time outside. 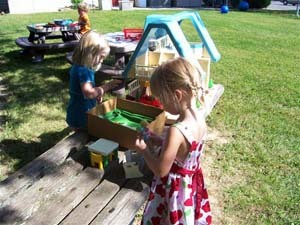 Messiah Lutheran Preschool is a Certified Nature Explore classroom. Visit www.natureexplore.org to share in our excitement! Please make sure your child has the proper clothing to participate in outdoor activities. Coats, hats, gloves/mittens, snow pants, and boots will be needed for winter play. Bulky items may be sent in a backpack or sack. Proper shoes are a safety must and tennis shoes are best for climbing, jumping, running, and balancing. Play clothes allow the children the freedom to experience the outdoors without worry about getting dirty. The Department of Children and Family Services, our licensing agent, requires a certain adult to child ratio. In order to comply with this regulation, we cannot make provisions for one child to remain inside while the class goes out. Please keep this in mind when determining when a child should return to school after an illness.